William Allen may have been considered a Loyalist during the Revolutionary War, but he deserves a bit of credit due to his part in constructing Independence Hall. Several times we have discussed if a Founder of the Day can actually be called a Founder if they were a Loyalist. Yet again, I am going to make some of you angry by issuing my opinion…yes, yes they can. Although the examples of these Founder-Loyalists are few and far between, I’d say the man who oversaw the construction of Independence Hall might rightfully claim his spot as a Founder. Allen had been involved with building the State House from the beginning, but now took command of the operation. Upon the building’s completion, William threw a gigantic party and invited the whole city to celebrate the new building. Forty years later, the Continental Congress would meet here. Allen would be loyal to the Crown. During the middle of the 18th century, William Allen held several important positions as a leader of Philadelphia. Most notably, William became Chief Justice of the Pennsylvania Supreme Court. He held this position for nearly twenty-five years. Additionally, Allen became a patron of Benjamin West during this time, funding his trip to Italy where he mastered the art of portrait painting. West (who I will make Founder of the Day ASAP) became the first colonist to gain international respect for his art before acting as a mentor to several of most important Painters of the Founding Generation. It is due to Allen’s support that West and his students gave us portraits of the Founders and, therefore, an idea of what they looked like. As the American Revolution approached, Allen, like most wealthy colonists, disliked the laws which Parliament was passing. However, he was not about to throw off the Crown which had made him so rich. Instead, he went to Britain and published a paper which he thought would help ease tensions between the Mother Country and her colonies. Unfortunately, like all other attempts to resolve these issues, he writings did not work. William Allen returned to Philadelphia in 1779, while the Revolutionary War was still raging. However, it is important to note, his return took place after the British left Philadelphia. As the Americans were back in control of that city, it seems likely that Allen should have been arrested for his loyalties and his property confiscated. Although being wealthy surely helped his case, the fact that he was able to retain his status in the city indicates to me that he was what I like to call a ‘Soft Loyalist.’ By Soft Loyalist, I mean he did not think independence was the best course of action, but he did not actively attempt to inhibit the Continental Army from winning the War. Truthfully, there were many Soft Loyalists at the beginning of hostilities (like John Dickinson and James Wilson) who ended up playing a large role in the Founding later on. Allen never had this opportunity, as he died just a year after his return from England in 1780. Allen had one other role in the Founding which was more accidental. As a young man, William purchased a large swath of land that he used as a hunting camp. Years later, he would plan the layout of a town on this property. The town that grew out of his small hunting camp took his name, and today Allentown is the third most populated city in the State of Pennsylvania. *Andrew Hamilton (no relation to Alexander) died thirty years before the Revolutionary War so isn’t really a Founder, but he was the lead lawyer on the landmark Zenger freedom of speech case which established that someone could not be sued for libel if they told the truth. Want to challenge yourself and see if you can feel sympathy for the Loyalists? ‘Tories’ is a really interesting look at Loyalists during the Revolutionary War. 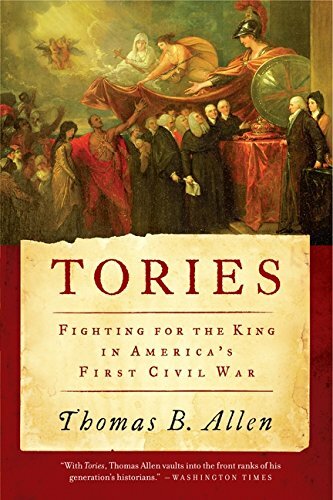 It helps to understand the American Revolution if you can take an unbiased look at the other side of things and this book is a great jumping off point for that. Also, I don’t know if I’ve every referred to the British as Tories in any of these articles so I’m going to have to start throwing that in there.